After five years of blogging on Blogger, it's now time to move on to WordPress (as announced earlier). While the flavour of Cutting the Chai will not change as a result of the metamorphosis from soumyadipc.blogspot.com to CuttingtheChai.com, I intend to add more spice in the new domain. Of late tweeting has eaten into my blogging. After the immediate release of a thought/experience via a tweet, I usually don't have the inclination left to follow that with a longer blog post. While Twitter is a wonderful platform but it cannot (no matter what people say) replace the blog. While I shall continue to tweet (@soumyadip), I promise to blog too. And this move is just a step towards fulfilling that promise. Having my own hosting gives me greater control my content and the WordPress platform, as everyone will agree, adds more fun to the blog. Those of you who subscribe to this blog via RSS/Atom feeds, don't need to update the URL in your feed reader. They've all been redirected. If you keep track of Cutting the Chai posts via email (powered by FeedBlitz), that has also been updated. Emails related to new posts on CuttingtheChai.com should land in your inbox. The new Cutting the Chai is still a work in progress. You'll find many elements from the old blog missing in the new. I'll gradually add them (and more). The soumyadipc.blogspot.com will remain for the near future, but all the fresh updates (have already imported all the old posts and comments) will happen on the CuttingtheChai.com. Might add a 303 redirection in the future for more seamlessness. Like the Dilliwallas, who experienced discomfort while the Delhi Metro lines were being built and blessed the mass transit system when it zipped them through the crowded city, I too hope that the momentary inconvenience that the Chaiwallah might make you undergo will finally result in a world-class experience. The World Cup is only a few hours away and like all the previous editions (right from 1986, though I don't remember much of that) I'll be hooked to the ball. Thankfully, this year the match timings are comparatively India friendly. Keeping alive the Cutting the Chai tradition of simple-printable-A4-sized-approach, here's presenting the 2010 World Cup Football South Africa schedule with timings in Indian Standard Time (IST). This schedule/calendar of the World Cup matches is in a simple printable single-page A4 format. Note that the listed matches are only for the Group Stage. Will put up another schedule for the knock-out stages once the group matches get over. The matches are sorted according to their time of play and have a very simple and easy to follow format (unlike most of the other World Cup schedules that I came across, including that on the official FIFA website). This Football World Cup calendar is available in two versions (both in PDF). The first has a little dash of colour and shading and the other is the ink-friendly version. May 29, 2010 marks the fifth anniversary of this blog. Of late, I haven't been paying much attention here. But this web log has been a constant element in my life, while things have moved on a fast pace in both the professional and the personal fronts. Today is a big day and the Chaiwali gifted me a Harley to celebrate the occasion. And not just any Harley-Davidson, but a 1936-vintage EL, also known as the "Knucklehead." 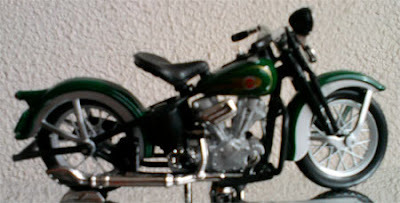 So what if it is only a miniature scale model, it's the closest I can get to owning a Harley in the near future. In the days to come I'll be posting a series of special 'Cutting the Chai @ 5' posts. For now I've an announcement to make. Cutting the Chai is moving on to its own domain and hosting (and powered by Wordpress). Still working on a few things there and will post a post when everything's good to go. The last major change on this blog was when the title changed from 'Mindless Musings of an Unmindful' Mind to 'Cutting the Chai' on April 14, 2006. Don't mind the title of the post. I couldn't help it. Afterall while T-Series' army of lawyers couldn't yet stop Guruji.com from indexing 'pirated' content, the previous post on Cutting the Chai seems to have got the website to remove other copyrighted material. The earlier design for Guruji.com's homepage, as pointed out in this blog, included unauthorised images from Shutterstock. Now they have removed the erring graphics. Am now eagerly waiting for the verdict on indexing the music. Interestingly, the mainstream media has almost ignored the Guruji episode, quite unlike when Avnish Bajaj, CEO of Bazee.com was put behind bars. Piracy, it seems, isn't as newsworthy as an MMS scandal. While one Guruji (Shibu Soren) has been upto his usual ways in the political arena, another Guruji, of the online sort, has entangled itself in the web of piracy allegations. According to media reports Anurag Dod, the CEO and founder of Guruji.com and a few other company executives were arrested by the Bangalore police on charges of piracy/copyright infringement. The complainant was T-Series (as you sow, so shall you reap). T-Series, like most music companies, has been crying foul over music piracy. Piracy has hit its bottomline hard. Here on Cutting the Chai, I have been writing about piracy and the ways that the music and movie industry can counter it. The arrest of Guruji.com's CEO is important news, because this case could define the future of online music sharing in India (at least from a legal perspective). Back in 2006 when Guruji launched, it focused on search results with a 'desi' flavour. But when they tried to add some music to it, it was apparent they they were hitting the wrong notes (melodious ones, if you hear from the users' ears). Much like the Chinese, Indians too are fond of their music and like to find it for free on the internet (Altavista was perhaps one of the earliest to include music search, but I can no longer find the feature and Google's is only for the US). Apparently the name Terrawiz didn't seem to sound something that will appeal to an Indian audience, therefore Guruji (the teacher). The domain www.guruji.com was earlier a site on Muralidhara Swamigal. Anurag Dod had the right credentials to start a successful online venture, a BTech from IIT Delhi and a Masters in Computer Science from the University of Michigan. And his baby Guruji.com wasn't doing too bad either (Guruji claims to have over 1.5 billion page views a month). If it hadn't been doing well, he wouldn't have been arrested. No takes notice of the failures. 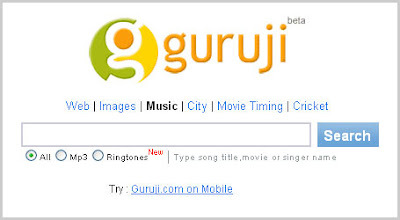 Over the years, Guruji.com has moved on from being a search engine delivering India specific content to a search engine delivering links to downloadable Indian music. They have even rejigged their homepage to show where their strength lies and what interests their visitors the most. They are now taking pride in being the "No 1 in music search." What would be interesting to know is whether the standard disclaimers, that Guruji.com and many other sites use, to wash their hands off indexed third-party content, holds any water in the courts. Guruji Music lets you search and listen to old, new, latest mp3 songs and ringtones. However, we have no liability for websites that claim to have free mp3 downloads. Guruji.com indexes third party websites and does not have control over, nor any liability for the content of such third party websites. This is very important in a broader sense, because many of us (particularly bloggers) link to external websites whose contents might not be legal according to the laws of the land. Earlier this year, China's Baidu had won a court case against music groups and was cleared of piracy charges. Wonder, how the Indian courts would read the T-Series versus Guruji case. Guruji could possibly get into another little copyright trouble over their latest design. A closer look at the new Guruji.com homepage, shows distinct Shutterstock watermarks. This clearly indicates that they didn't create the image, nor did they take permission to use it. Whoever is responsible for the design, did a lazy job (just picked up from the net and didn't even bother to clean it up. As they say nakal mein bhi akal lagti hain). Moreover no one at Guruji also seems to have noticed. To Guruji.com's credit, their music search works wonderfully. They even give upfront links from where users can download the files directly without necessarily having to go to the website hosting the content. If you don't wish to download, there is the listen option. You may also dedicate a song to a friend and download a ringtone-version of the song for your mobile phone. The website is available in eight languages and it indexes songs of at least nine languages. Too much of a good thing can sometimes get you into trouble. At a previous workplace I was trying to bring in more music content for our music website and had almost inked a deal with the impressive new startup Grooveshark. They seemed to have everything right about them and claimed that they even paid the due royalties. But the legal mumbo jumbo was a bit grey in some parts and we didn't want to get our hands burnt. Though it had a lot of potential, we had to unwillingly, shelve the plans. "Music is risky business," my boss told me. Since Anurag is his own boss, no one seems to have told him that. Guruji.com is an easy target for the music companies because they haven't shrouded themselves behind a clock of anonymity. Go to Guruji.com and you'll find all that you want to know about them, the management team, their addresses. 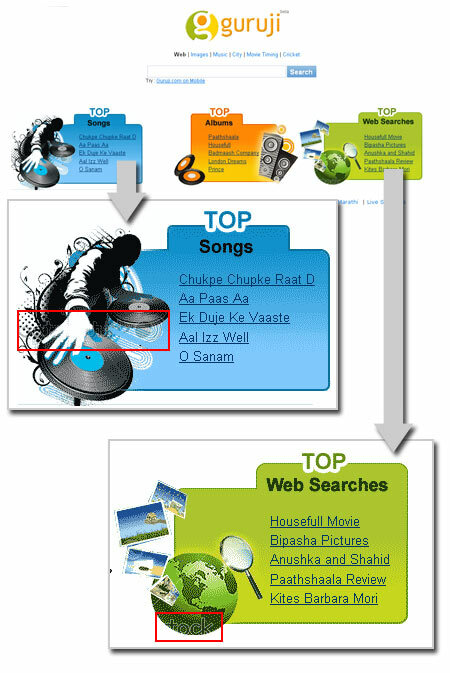 On the contrary, another popular Indian music search engine Phulki has played it safe. They haven't put up any contact info on their website and a whois search draws a blank as they have kept their contact info private. But I've heard of Phulki executives doing the rounds to tie up with other websites. Don't know if they hand out a business card or not. What Guruji has been doing is very borderline. But as I have argued before, the music companies are getting it all wrong. They could take Guruji to court but what about songs.pk (haven't deliberately linked to the site, unless T-Series decides to drag me to court too. I can't even afford a decent lawyer) and the innumerable other sites and blogs that pass on illegal content. And the biggest of them all, P2P. They can't be shutting them down all. They have to come up with an alternative, at least T-Series tried to. Apple's iTunes Store has displayed that people are willing to pay for their music, but then it hasn't been tried out in India. We Indians often react a lot differently than the world. But someone needs to go out and do something. In.com, Bollywood Hungama and Rediff SongBuzz are letting us listen to music for free and that too legally. Interestingly, Guruji.com doesn't seem to index the above mentioned three Indian websites that legally stream music. At least the random search that I ran, didn't find any mentions. What we need is a also service via which we can download music to our devices and at a small fee. Something in the range of Re 1 to Rs 5 per song would be fine. Personally, wouldn't mind paying a small amount (~ Rs 10-15) for an album. Given that the files are of good quality (~320 Kbps) properly sorted and tagged. Something the pirate sites never do well and when they do they don't forget to include self-advertisement in the tag fields. Give me websites from where I can legally download my music from and not too a high a price (after all it's about pricing it right) and also have websites like Guruji which can then become a legal music search engine (and also a selling platform). I search for the songs I like on Guruji (and also preview them) and add them to my cart on Guruji (that saves me the hassle of going to the T-Series website for one song and then to Saregama for another). I make my payment on Guruji.com and download the songs from there itself. Guruju.com can be a desi iTunes Store but thoda hatke (How they share the revenue, is their problem). The truth is that CDs are fast becoming obsolete. MP3 is here to stay, until a newer and better format is widely accepted. Indian music companies have to innovate fast or they would just fade away. And that will be a loss for music, musicians and music lovers. While some may argue that Guruji is only indexing and displaying relevant results to the user and there is nothing illegal (or unethical) about it. JPK at JudeTheObscure says "It's like arresting L&T executives because people have been transporting hooch over the flyover they built." But here it appears that, they have also built a special carriageway for the exclusive purpose of transporting hooch.